This "Timeless Classics" station was heard at Smøla three weeks ago. Facebook response today, and they even wanted to put my recording on their site. Their market is Buffalo, NY. Disturbed propagation often results in very unusual catches, and WBAA is really in that category. I heard it last weekend in Kongsfjord, and an email report on Monday was given immediate attention. WNYC had a very good signal one night at Smøla in August. After a couple of misses I found a very interested gentleman who confirmed my reception. 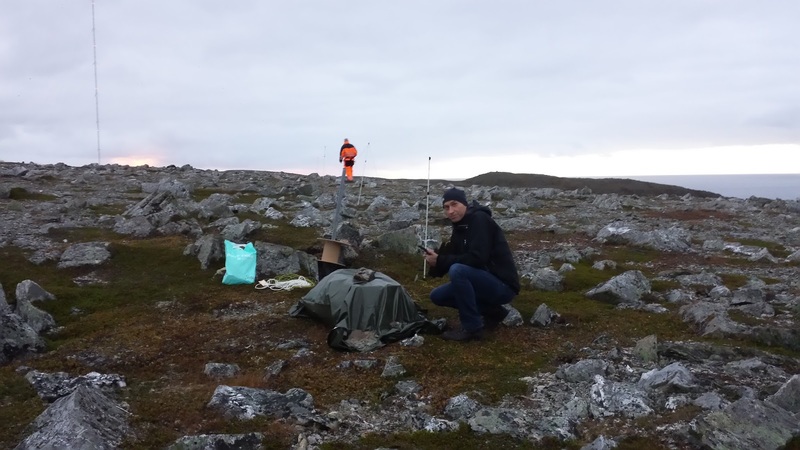 Not only that, they published a Tumblr post where they put my recording (quite nice quality I'd say) and the picture I sent from my main DX location in Kongsfjord. In the post you can also view some of the old-style (and actually really old!) QSL cards they issued when QSL cards were the norm. CJBQ had a fair signal above CKLW for a few seconds last weekend, perfectly matched with a nice ID. So a report went off today, and I got a swift response with the question would I like to be on the radio on Tuesday. Well of course! Thanks OJ for alerting me. Heard briefly but with a fine TOH ID during very disturbed conditions on September 21. Email response today. Massena is as "upstate New York" as you can possibly get. Good conditions towards southern USA on September 20 gave us this rare station. Thanks Ole for detecting it and OJ for finding such a nice guy to respond! Kongsfjord at its best. OJ Sagdahl alerted me about this oldies station which came up at Smøla with a "The Blizzard 98.3 and 105.9 FM and 900 AM" ID. Email confirmation yesterday. WBRV is owned by Flack Broadcasting, which also operates "The Moose" on two FM frequencies. My second QSL from the Mount Loran experimental site. It faded up from nothing during a local break, gave a promo with several IDs and faded down again into the massive signal from CFFB Iqaluit NU. Long and friendly response this afternoon. Wisconsin # 40. OK, so here it is, the new kid in (the SDR) town, the KiwiSDR. On the top shelf, with three old blokes below, all named Perseus. And here is how it looks, when tuned to the only daytime broadcast signal I have, NRK Ingøy on 153 kHz. Lots of noise down there as well. 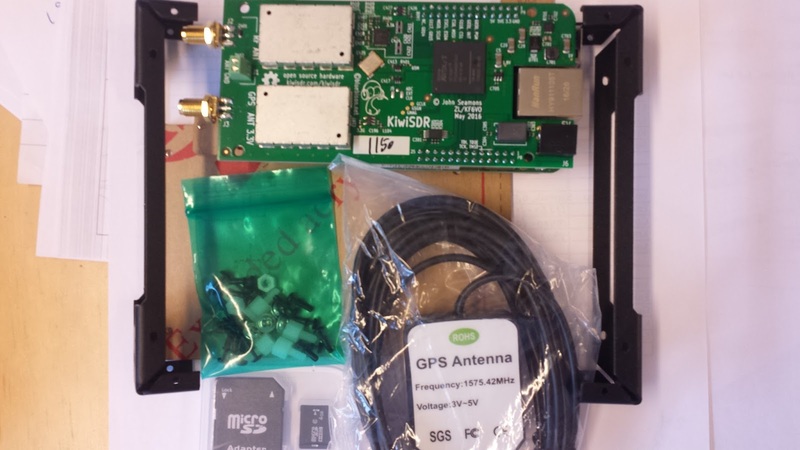 The box, described as a kit, comprises the SDR board and a BeagleBone Green computer. So it doesn't need to be connected to a specific PC. No software is required, you set it up on an HTML5 capable web browser (which excludes Internet Explorer. I have tested with Edge and Chrome, and they work fine). Unlike other SDRs, the KiwiSDR is supplied with a GPS antenna. With GPS enabled (not yet tested here), frequency accuracy and stability will improve, especially on higher frequencies. And speaking of frequencies, the KiwiSDR is a standard HF device, capable of tuning 0 - 30 MHz. It's a bit unfair at this stage to write a "review" of the receiver. The user interface is, I understand, a work in progress, and I have addressed several suggestions and comments to the developer. It will be interesting to see in which direction the user interface evolves. I did make sensitivity measurements (as I always do when I get a new receiver), but the results were inconsistent with real-life observations, so I will let that rest for now. Real-life observations, in the form of comparisons with the Perseus, did tell me that the KiwiSDR is a very good receiver. It hears what the Perseus hears, and I was not able to overload it. 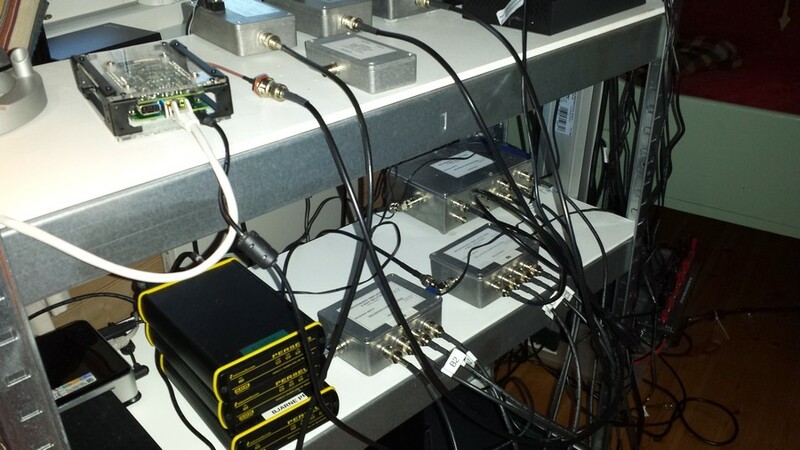 In its present form, the KiwiSDR is for "live" listening only, and with the capacity of four simultaneous users, locally or as a server for external access. My 4G ISP is unable to provide an APN for me to make it available online, so that door's been shut. For now. 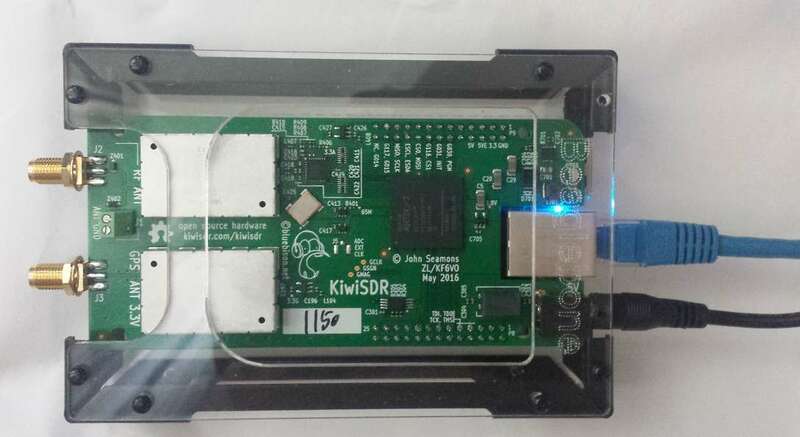 The KiwiSDR will set you back USD 299 + shipping. You have to use your own ethernet cable and power supply, which should be 1.5A, 5VDC. 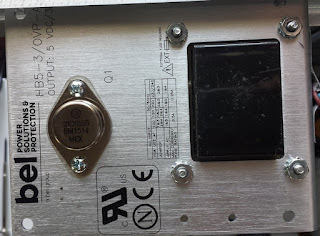 I tested with a 1A PSU and it crashed. Well, not the PSU. The antenna input is SMA. Another thank-you to OJS who alerted me about this excellent catch with excellent signal a few days ago. Email response this afternoon. A few days ago WOBL faded up with a decent ID below dominant CJMR. Confirmation from the PD this afternoon. Ohio # 30. WDLA has been heard on a number of occasions, and with a fine signal a couple of days ago. A Facebook exchange ended with them plugging a message for me on-air this morning. As luck would have it, conditions shifted and they were nowhere near audible. I didn't find a logo for their AM station, but here's one for their FM. My first Mt. 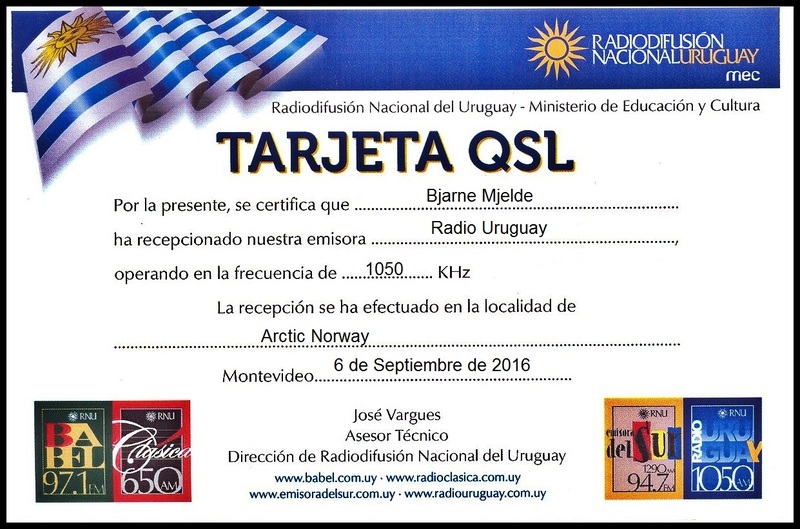 Loran QSL! Thanks to OJS who detected a weak signal during otherwise quite lousy conditions on Sep 9. I first wrote about this Kickstarter project in March. They met their funding goal, and scheduled delivery in November (Beaglebone + KiwiSDR combo). It arrived yesterday, so for once a project with no delays. 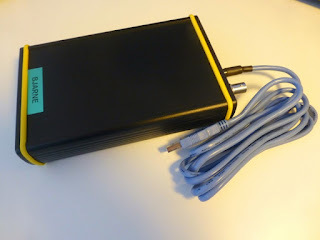 The SDR comes with a simple enclosure (unassembled) and is basically ready to go once the antenna, ethernet cable (no wifi) and 5VDC power is attached. A bit of fiddling with my router and PC to get it going but quite simple actually. No need to install drivers and control software. All you need to do is to open your web browser (mostly any web browser as long as it's not Internet Explorer) and there you are. It's possible to run this as a server for external access with up to four simultaneous users. It will be tested with antennas the coming weekend. As usual, I will also do sensitivity measurements. KiwiSDR unassembled. Preinstalled software on memory chip. KiwiSDR assembled and running. No antenna connected. Berlevag's Loran C site, a 25- minute drive from our Kongsfjord DX location (14 km as the crow flies), was a serious challenge for MW DX here. Transmissions closed on December 31, 2015, and DX has been a lot easier since then. However, we wondered if the Loran C site could pay back in some way, so we started to investigate the possibilities to put up a temporary beverage antenna there. The plateau (not really a mountain) is almost flat terrain on rocky soil near the ocean, and with some OK spots for placing ground sticks. An added benefit is that it's accessible by car - a very important issue when you need to carry 1000 meters of antenna, and heavy batteries. The starting point is around 150 meters from a dirt road. After a few inspections we found the ideal place for a 1000-metre beverage at 305 degrees, aiming at the US east coast. After receiving the necessary permission to use the facility, we started planning. We wanted to do unattended wideband recordings but with internet connection so we could monitor and listen online. 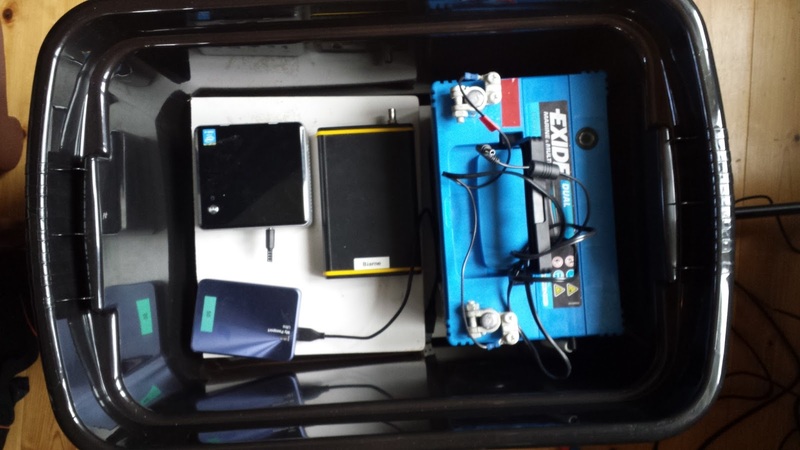 We opted for an Intel NUC PC, which can run off a 12VDC supply such as a battery. The NUC also has USB 3.0 outputs so it can power a Perseus and a small 4G modem. And of course a 2.5" hard drive. The battery was 80Ah and had been tested to run continously for 58 hours, although indoor and without the 4G modem connected. 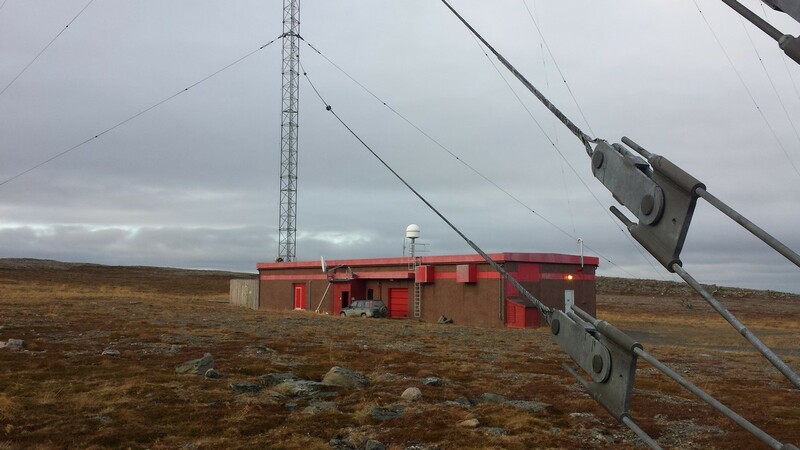 It turned out that the Loran C station had an unexpected last twist up its sleeve, namely the strobe light on top of the 214-meter mast. The noise was at first very demotivating, and at one point we decided to abandon the site. Luckily we changed our minds. The pulsating noise does ruin DX on many frequencies. But with changing between USB og LSB and adjusting filter widths the benefit outweighs the cost. 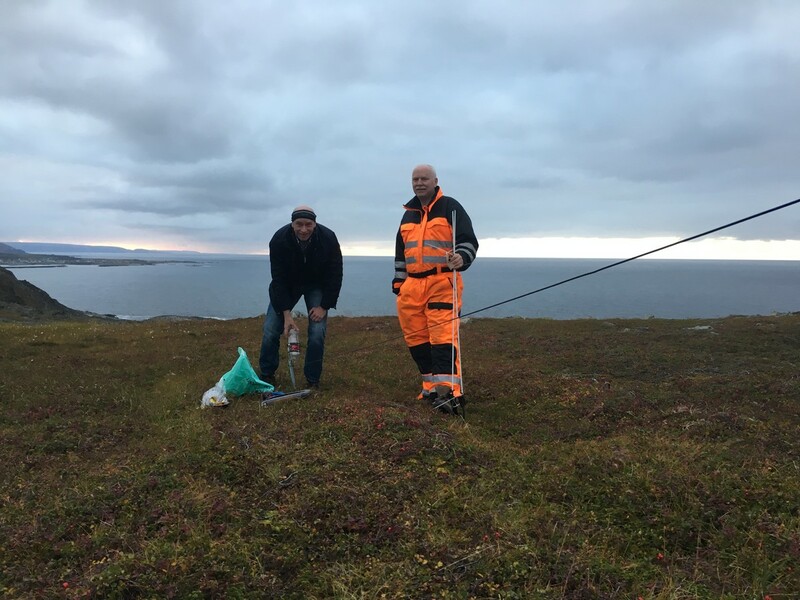 At the time of testing, we also compared this 1000-metre, 305-degreees beverage with the Kongsfjord 275-metre, 310-degrees beverage. Apart from the strobe light noise, the noise floor is very low and signals are exceptionally clean. 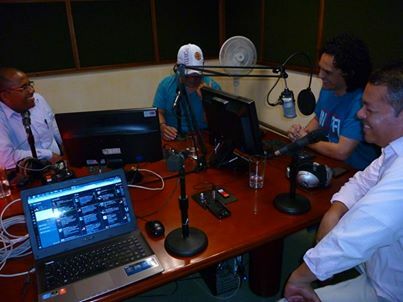 We also noted that on most frequencies, interference from European and Middle East stations was significantly lower. Signals from North America arrived earlier, disappeared later and were generally stronger than on the Kongsfjord beverage. This rather brief test very early in the season was to gain experience with the logistics, testing the equipment and finding out if we should proceed during the KONG33 DX-pedition in late October. There is no doubt we will do this again. Maybe we find a way to reduce if not eliminate the strobe light noise. What will happen to the Loran C site in a longer perspective is anyone's guess. This and the other Norwegian Loran C sites were scheduled for dismantling, but apparently a UK company is now negotiating on bringing the network back to use. If so, we need to reinstall our Loran C notch filters. 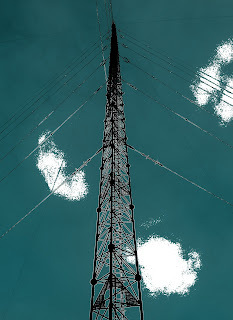 If not, the tower and other equipment will likely be put down, and we may have a noise-free location for the future! Terminating point. Bjarne (left) and Ole Forr. Pennsylvania below the horizon. Starting point. OJ Sagdahl (in front), Ole Forr. WFFG was heard in early January, and after searching round a bit for someone to contact, I finally found the present owner who kindly confirmed my reception. A long letter in pdf format with pictures attached received today for my August 18 report. 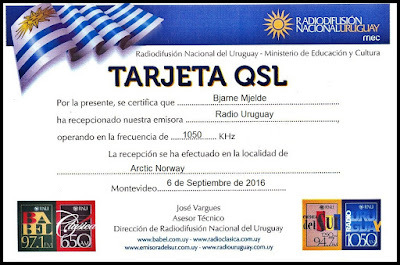 e-QSL in my inbox this morning. Thanks Horacio Nigro for contact info. 2LF together with several other Aussies had a great signal three years ago in mid-September. My emails bounced though, but today I got in contact with their Ops Manager who kindly confirmed 2LF. The station was probably audible on the super opening on August 28 as well, but mostly covered by Asian stations. 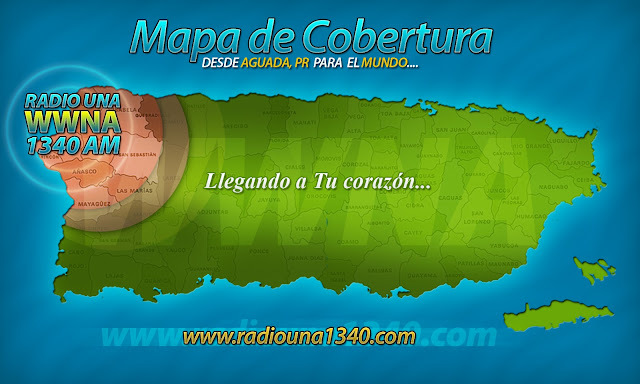 In October 2013, I was lucky enough to hear, and confirm, WWNA Radio Una 1340 AM from Aguada, PR. The confirmation was in fact machine-translated into Norwegian. This afternoon, to my surprise WWNA sent a coverage map. In my early days of DX-ing, coverage maps were often received from North American radio stations. None of them were anywhere near as beautiful as this one, so I thought I'd share it. Now, two commercial Aussies in your inbox in just a few hours is awesome! 5AU was heard mixing with 8TAB in Darwin on August 28. A cheerful facebook message confirmed the reception. Ole Forr informed he had heard this, and even provided a v/s for me, thanks! Heard when Asian signals in general were a lot weaker than usual due to a solar disturbance. Some Queensland stations slipped through with fair signals. Powering Your Perseus (or any 5VDC SDR): Does The Source Matter? SDRs like the Perseus and Cloud-IQ are sold with switching 5VDC power supplies. While the Perseus PSU is in fact rather quiet, I am no fan of switching power supplies. So I try to avoid, and find linear devices instead. This consideration is for one purpose alone: To minimise noise. In a noise-free environment, even a 5 dB higher noise floor will affect DX. A couple of years ago I bought this Friwo 1A transformer-based linear wall mount from Germany. It's quite heavy and runs a bit warm since the Perseus takes up around 750 mA of its capacity. But it has worked well. I don't remember what I paid, and it doesn't really matter because they are no longer made. I understand that a 5V linear wall mount is still manufactured in the US (Jameco, 1A), but it will fry if you connect it to 240VAC. With the advent of USB 3.0 ports on PCs came an alternative way of powering my Perseus. A USB 3.0 port is limited to 900 mA, which is enough to power a Perseus and Cloud-IQ (but not enough for a NetSDR). 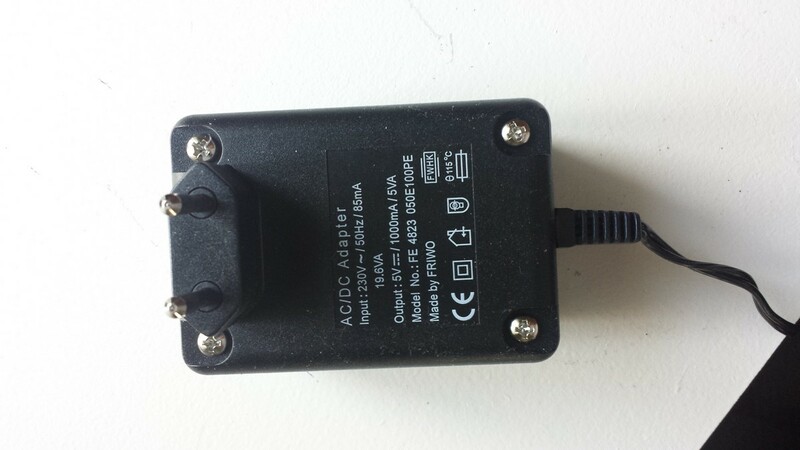 I have a few cables designed for the input connector of the Perseus, and they are abundant on eBay for around USD 6.50 including shipping. The one pictured below was a lot more expensive though, but hey! It's blue! USB 3.0 ports have very accurate voltage, mine measured 5.01V (a Dell Latitude desktop PC). you need to place the correct jumpers and solder the AC and DC cords to the correct solder lugs. My DVM shows the voltage output to be 5.03V, so it's very accurate. It should easily power my three Perseus. So which is less noisy? Most important for many perhaps: Is the power supplied from my PC's USB 3.0 port acceptable? I set up a test with the Perseus connected to a 270 meter beverage antenna at daytime, when no signals were present on the MW spectrum (but a few local NDBs and other UTEs on LW). As you can see from the spectrum displays below, there is practically no difference, except a couple of more pronounced spikes from the PC power. Taking into account that not all PCs are necessarily alike, it does appear that a USD 6.50 cable from your available USB 3.0 port will provide an efficient and noise-free power for the Perseus, Cloud-IQ, and probably many others. The noise level will not be noticeably higher than using a more expensive linear supply. If you wonder about the increased noise floor below 800 kHz, it's likely due to a wind power facility 9 km away. It probably causes the variations further up as well. Another response from the August 28 opening towards Australia. 3SH was running the talk show Australia Overnight at the time, but did a short local ID on the top of the hour. Confirmation via Facebook. 14700 km isn't bad for 2 kW!